While I probably took the 2007 championship for granted, its interesting to me how it almost slipped out of their grasp during the series against Phoenix. We were in complete control of that series…took home court in a fantastic Game 1, dominated Game 3 and dominated most of Game 4. And then the Spurs just gave Game 4 away at the end. Ugggg. When Boris Diaw, A’mare Stoudemire, and Robert Horry were suspended for Game 5, you would think the Spurs would be the ones with the advantage. Well the Suns controlled Game 5 from the opening tip, jumping out to a 16 point lead. It never felt like the Spurs could get anything consistently going, other than Tim Duncan doing his thing. The crowd was going crazy, lathered up over the suspensions and Horry’s dirty hip check and the Spurs looked like they weren’t taking it very well. Sloppy, uninspired play by the Spurs and suddenly the season felt like it was slipping away. The Spurs were down 10 with 2:29 left in the third quarter and Manu had 6 points up to then. Things were looking bad. As Spurs fans, we should have known Manu was about to do some serious heavy-lifting. He started things off by stealing the ball from Raja Bell and drawing a foul, causing Bell to get a technical foul (love how often Manu is able to cause this). He hit some free-throws and then a three right at the end of the quarter to get the Spurs within striking distance. Then, for the next twelve minutes, he proceeded to dance all over the US Airways floor, darting around screens, hitting step back threes, driving for layups, drawing fouls on three-pointers, hitting all of the big free-throws, and grabbing five FREAKING rebounds in the quarter. (He’s a 6’5, scrawny guy, but put him in the biggest moments and he will grab those rebounds.) All told, he had 15 points in the fourth and 20 of his 26 points in the last 14 minutes of the biggest game of their season as the Spurs pulled it out in the end on a Bowen three. Now based on all the above, this game by itself is a great Manu game but number 3??? I mean he had a much more dominating performance just one game later in Game 6 to close out the Suns. So why number 3? 1.) A lot of guys can be awesome early in playoff series only to struggle once the series gets tight (ahem LaMarcus Aldridge). Manu is at his best when his team needs him most, usually in Games 5-7 (this is all anecdotal, I didn’t look into this, but this is how I feel after watching him for 15 years). Here, the season was on the brink, he was struggling, his team was struggling, the crowd was frothing in rage towards the Spurs, and he just turned it on and brought the Spurs to life. 2.) Maybe Manu’s most irreplaceable facet is his ability to lift his team’s spirit when they are down. The Spurs basically seemed to be playing this game in a fog, almost like they were depressed for giving away Game 4 and mentally unprepared for the vitriol that Phoenix’s fan-base now had towards them. Tony Parker was struggling and the offense was stuck in mud. But Manu reinvigorated the whole team with his moxie and bravado. Once he started sticking those threes (he had three in a four minute span), the whole team started clicking again. Parker was getting into the paint and drawing the defense, freeing up Finley and Bowen behind the arc. Bruce started locking down Steve Nash and hit the game-winner. Timmy manned the back line on defense and the entire team was just in synch…and it felt like it was all due to Manu jump-starting them. 3.) Finally, a Manutastic game at home is expected. He feeds off the crowd like no other Spur. But the games where he plays the role of road assassin are sooooo satisfying. The way he seems to thrive when the opposing fans are booing him mercilessly. The way he silences the crowd with big, ballsy, shots. The way he seems to hit all the big free-throws down the stretch with nary a reaction. And, most importantly, its the way the opposing fans HATE him because he destroys their dreams. 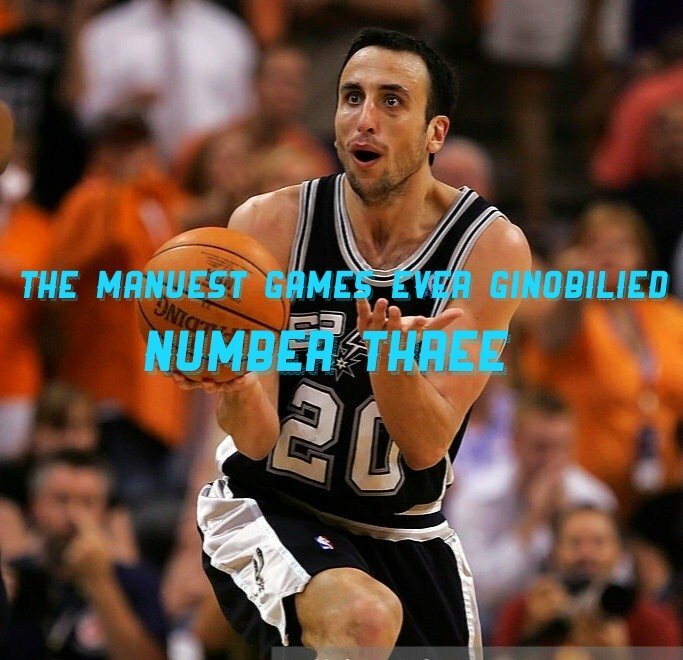 That’s what Manu did this game.